Come and check out Perimeter's latest resource of black holes. There will be activities that are suitable for the grade 9 universe unit as well as both the grade 11 and 12 physics courses. Please R.S.V.P. to James Ball (james.ball@ugdsb.on.ca) if you are planning on attending. DDSB STEM Talk in the New Year! The ‘Demo’ is one of the most powerful tools that physics teachers have. It can hook the students’ interest right away. If you frame the demo with a pre and post dialogue, it can also ignite their learning. We are excited to announce funding support to Northern Ontario Teachers to attend the OAPT conference at Wilfrid Laurier University in Waterloo, Ontario on May 12-14, 2016! The Northern Ontario teacher Subsidy will cover the cost of travel, accommodations, registration, and supply coverage! Don’t miss out! The TAPT session Physics Games — Phun with Physics has been postponed until after Christmas. We will make another announcement when the new date is confirmed. Chris Meyer, OAPT VP teaching and learning, Assistant curriculum leader York Mills C. I. Start the summer with a two-week introduction to the theoretical and experimental study of quantum information processing which includes 30 hours in the labs. You will get the opportunity to interact with students from around world, work with graduate students, postdocs and IQC faculty. This program is fully funded — including your accommodations and food. You can also apply for travel bursaries. Watch this quick video to get a feel for the full experience. Join us at IQC for the summer through an Undergraduate Research Award and work with one of our researchers – experimentalist or theorist. Not only will you enhance your research experience and prepare for your graduate studies and research career, but you get the chance to attend IQC seminars, lectures, and student talks. This is a unique opportunity to interact with an interdisciplinary research community. You can choose to only apply to attend USEQIP, to only apply for an Undergraduate Research Award, or apply for both. If you only want to apply for USEQIP, click the USEQIP button. Complete the application but do NOT check the box for the Undergraduate Research Award. NOTE: session postponed until after Christmas. Will be reposted when date confirmed. Games can be an excellent way to reinforce student learning. In this session, we will play three different games designed for kinematics, and discuss how they fit into the curriculum. KineCards: A card game that builds position-time and velocity-time graphs of an object's motion. Players must play matching D-T and V-T segments while competing to end at different positions. The Amazing Rally: An orienteering game that sends students around the school following a trail of clues. Players must draw and follow a vector diagram while maintaining a schedule, neither too fast nor too slow. Space Battles: A 2D space miniatures game. Players pilot spaceships which use realistic vector acceleration and movement. Advanced options add combat and relative velocity. Although this TAPT session focuses (naturally) on physics, we will also have non-physics games on display for those of you teaching other science courses. As usual, we will have snacks and socializing time from 4:00 – 4:30. Please email Robert (robert.prior@tdsb.on.ca) to let him know that you are coming so we can be sure to have enough food. See you there! Over the past 18 months the OAPT has been working with Paul Rapovski, CEO of FAST Motion Studios (2 Denison Rd W, Toronto) to develop an experiential field trip for high school physics students. The intent is to reveal the variety of career pathways in the recession-proof business of entertainment production — movies, television and gaming. We successfully tested our model in September with a focus group of physics teachers — including a complement from the OAPT team. This field trip program was revealed at the recent STAO conference and we are extending the offer to our members. Field Trip teacher's package: contains flyer, instructions and student waiver form. Field trip flyer, alone: for distribution to students, parents, admin etc. Please feel free to pass these along to colleagues. The first step is to identify potential date(s) for the field trip and connect with me to confirm (dave@fastmotionstudios.com). As well, contact me if you require more information. Thank you for your time and attention to this unique and exciting initiative. Upcoming STEM Talk at the Durham District School Board on November 25 at 7:00 pm! Please share it with educators, students, parents, community members and any STEM (Science, Technology, Engineering, Mathematics) enthusiasts! It is a free event and all are welcome to attend! Mark your calendar! Hope to see you there! When asked to draw a force diagram for some simple situation, most students emerging from any level of introductory physics course are likely to draw objects which look like a porcupine shot by an Indian hunting party—the number and direction of pointed entities being essentially stochastic. My name is Eric Haller. I’m a new teacher and I am currently at the start of my third year teaching in China. Even though I live so far away, I was able to make it to the physics camp in Sudbury two summers ago. There I got a book called FIVE EASY LESSONS: Strategies for Successful Physics Teaching by Randall D. Knight, which I highly recommend. In this book, Knight talks about many different ways we can improve how we teach physics, a few of which I’ve actually tried out with my students. I want to share with you one of the successes I’ve had with those strategies, here is how I teach my students to draw system and free body diagrams. 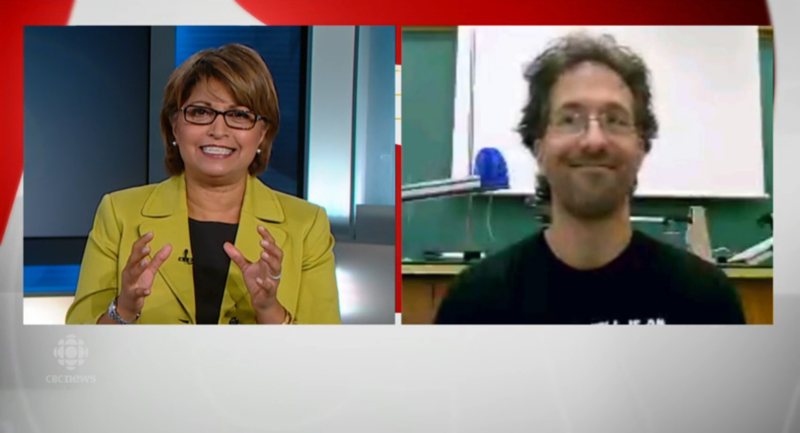 A physics teacher from Guelph’s John F. Ross CVI has won a prestigious award, recognizing excellence in the teaching of science. Today the Nobel Prize in Physics was awarded to Canadian physicist Arthur McDonald for his work on neutrino oscillations. Chris Meyer heard about it while driving to work, and talked about it with his first period class, but little did he suspect that before noon he would be interviewed by CBC Newsworld! This year’s OAPT conference will be held at Wilfird Laurier University, Waterloo form May 12-14 and the theme is Capturing Diverse Perspectives in STEM. See the flyer for more information about the conference. Waterloo Engineering has partnered with the Goethe Institut to run a new engineering competition this November for girls in grades 10-11 (WE GO Design). WE Go.DEsign is a two day Engineering Design and Research Competition for women in grade 10 and 11 presented by the Goethe-Institut. The Grand Prize will be a language, engineering and culture trip to Germany during Summer 2016! There are two elements to the competition, a Research Symposium and a Design Challenge. Each element will be judged by Goethe Institut and University of Waterloo faculty and staff, with prizes awarded in each element. James Ball, OAPT Membership Chair, Physics Teacher, John F. Ross C.V.I. The Martian is a very entertaining movie, which will appeal to a wide audience. As a physics/science/science teacher I found it to be particularly enjoyable. Come explore the Challenge of Quantum Reality, a classroom resource designed by educators in collaboration with Perimeter Institute researchers to introduce senior physics students to the wonder and power of quantum physics. Experience the electron double-slit experiment as you participate in a hands-on classroom activity that will introduce the fundamental concepts involved in wave-particle duality. Fly through the air with the greatest of ease! Stage epic martial arts battles or use your super powers to save the universe! Find out how they really do these amazing stunts in Hollywood movies! At FAST Motion Studios your students can design their action movie sequence, act it out on camera, and analyze the physics! Would you like to deepen your understanding of quantum mechanics and how to convey its beauty and societal importance to your students? The Institute for Quantum Computing (IQC) has a free workshop on quantum mechanics and technology that will provide you with lesson plans and affordable, ready-to-go activities to take back to your classroom. On December 5 and 6th you will participate in hands-on activities, attend a few lectures and enjoy enrichment activities, as well as take part in roundtable discussions on how to incorporate what you’ve learned into your curriculum. Space is limited, so apply now for TQT, December 5-6. If you wish to be added to the mailing list to automatically receive updates about TQT as well as our high school students program, please sign up here giving us the consent to add you to the list. At this session, you will get a chance to visit our new “Practicals” room where our physics majors do their weekly activities. I’ll be sharing my experiences teaching physics by having university students work through activities in teams of 3 or 4 – rather than the lectures that you probably experienced. You will get to play – just as the students do – with three physics toys. Using “Poppers”, you will work through an inquiry-based lesson based on the different forms of energy and how energy can be transformed from one form to another. Next you will try out our good quality yo-yos and work through a lesson based on friction, work and torque. Finally, you will use a Cartesian Diver, to explore pressure, volume and buoyancy force. There will be lot of time for questions and discussions of how to make the high school-university transition smoother for our students. As usual, we will have snacks and socializing time from 4:00 – 4:30. Please email Chris (christopher.meyer@tdsb.on.ca) to let him know that you are coming so we can be sure to have enough food. See you there! Does static electricity have you perplexed? Boost your confidence and improve your understanding of this fascinating and shocking (couldn't resist) topic, which is the foundation for our understanding of current electricity. Join Chris Meyer at York Mills C. I. for an after school session of hands-on exploration. You will work through an inquiry-based lesson on the fundamentals of static electricity and build your understanding of how charges behave in solid matter. The lesson helps target common student (and teacher!) misconceptions and will be of particular interest to teachers of grade 9 science and grade 12 physics who would like to polish their skills. The session will also give you lots of ideas for activities to use with your students. Grab a colleague to bring along! As usual, we will have snacks and socializing time from 4:00 – 4:30. Please email Chris (christopher.meyer@tdsb.on.ca) to let him know that you are coming so we can be sure to have enough food. See you there! Please visit stao.ca for more information! The 2015/2016 school year is starting up and as you start to think about the courses you will be teaching and the work you will do with your students, I encourage you to connect with us as we work together to support physics teaching in Ontario. The OAPT Conference will be held on May 12 – 14, 2016 at Wilfrid Laurier University in Waterloo, Ontario. The conference will provide active learning workshops, collaborative networking opportunities and exploration of current trends in scientific and technological research. This year, the OAPT conference will focus on Diversity in Physics and STEM. OAPT continues to support physics education at STAO. Workshops will be presented for Grade 7-10 science programs and the OAPT will be present in the exhibit hall. Let your fellow science teachers know! One of the most valuable resources for Ontario physics teachers is now available on the OAPT website. It is a set of videos showing the grade 11U and 12U physics courses as taught by Chris Meyer - our V.P. of Teaching and Learning. Each video is a single lesson (edited to 15-30 minutes) and is accompanied by a student worksheet and a short description of the pedagogy and physics presented. Applications are now open for “Science Unlimited Summer Camp” at the University of Toronto! A once-in-a-lifetime opportunity for high school students to participate in a week of Physics, Astronomy, Earth Sciences, Computer Sciences, Math and Chemistry workshops. The OAPT Conference is quickly approaching! Join us at the University of Guelph on May 7-9! Let's explore the exciting world of science and build a network of science and physics educators from K-12 to post-secondary! Active learning workshop by experienced teachers! Update from University of Guelph researchers! Why take part in a Physics Contest? While they are in high school, I encourage all of my students to try their hand at a physics contest — at least once. However, it must always be seen as a voluntary enrichment activity, as like any adjudicated performance, a contest creates anxiety. To help my student cope with this I share the following advice. First, you can choose your level of preparedness. You can simply show up and write it, or you can prepare, if you wish to. It is up to you. Second, if you are not completely satisfied with your results, you do not need to tell anybody your score. Conversely, take pride in your score if you do well (just don’t forget there was some luck involved). Third, the OAPT contest is linked directly to SPH3U curriculum. It has questions from the 5 units (Kinematics, Forces, etc.) and is a great review for the exam. And, any preparation students undertake in preparation for their final exam will counter the effects of anxiety later on. I would like to encourage you to think about offering the OAPT contest to your students this year. It is free. It takes 60 minutes of class time and it might be the last physics contest they ever write! The 2014/2015 academic year has been an exciting one with many new initiatives for the OAPT. The OAPT website has a new look and the upcoming conference hosted by the University of Guelph Department of Physics promises to be another opportunity to obtain inspiration for physics/science teaching and network with educators across Ontario (K-12 to Postsecondary). Additionally, the Newsletter team continues to find ways to improve our OAPT publication. Several years ago we shifted from a quarterly print newsletter to an electronic publication, which in addition to being environmentally conscious, allowed us to include colour images, and a greater variety of articles. The latest rendering of the newsletter offers the same articles, but with greater immediacy as you will no longer have to wait quarterly for your fix of physics! Articles will be published at newsletter.oapt.ca, and archived by date of publication. Categories and tags will enable you to quickly find articles of interest to you; and, the complete set of past issues are readily available. As we move to a more dynamic platform to share upcoming events, news and resources, we encourage all of you to contribute to the Newsletter!